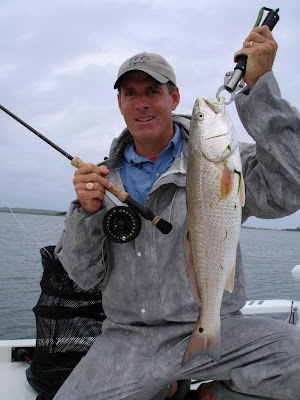 IFA REDFISH TOUR - Event 2 - Surf City - RESULTS! 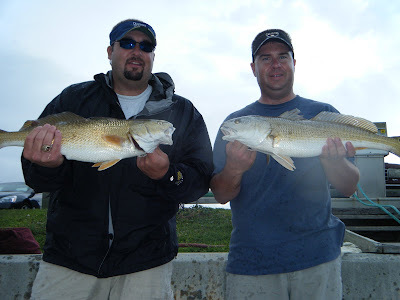 Team Crystal Coast Graphics, Mike and I, fished the IFA Redfish Tour's 2nd tournament of the Atlantic Division this Sat. May 23rd out of Surf City, NC. There were 44 teams that showed up for the competition. Teams from Fla, GA, SC, and NC competed for a chance at a $30,000 dollar Ranger Banshee Extreme flats boat. Mike and I had a good gameplan layed out and great weather to fish our spots. The only tough factor today was the Memorial Weekend Traffic! Our first spot produced 9 Reds with the largest at 7.17lbs and 25 3/4in. We moved on to several other locations and picked off a couple more reds but, nothing to upgrade what we already had. A final location showed us a school of about 150 reds and we quickly landed a 27 1/2in fish that was about 9lbs but unfortunately it was 1/2in oversized. A few more fish and we put a 24 1/2in fish that was strong at 5.85lbs. We had a trolling motor issue and decided to head to weigh-in early. Check out the results below. Mike and I would like to thank Ranger Boats as one of our sponsors as well as the Primary Sponsor of the IFA redfish tour. If you love to fish, and you're looking for a new boat, Ranger not only supports the sport in Fresh and Saltwater but, after seeing how these boats are built at the factory, it's no wonder why they are the best built boat with the highest quality materials available. Our new Ranger 2410's have arrived and they are amazing! About 13in. of water fishing reds on the flats then, running 20+miles offshore fishing Mahi, Kings, Grouper and more in a solid, dry ride! If you're interested in looking at a new or used Ranger, give Mike or I a call or call Collin's Inc. in Smithfield, NC for the best deals! A special thanks goes out to Chris Ulmer and Crystal Coast Graphics for his support this season. Chris has the most up to date graphics software and equipment and does an amazing job on his boat and vehicle wraps! Check out his work at http://www.crystalcoastgraphics.com/ and look for a pic of our new wraps here on the site soon. The Redfish have Arrived in Numbers! May 17th with Todd Rowe's crew on for a morning trip before the storms set in. 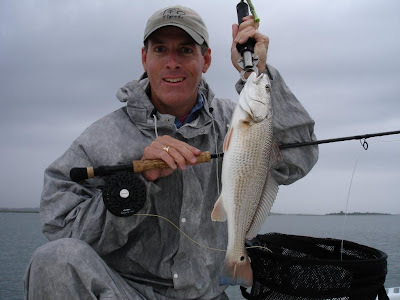 We found a couple places holding redfish that were willing to strike our topwater baits and Gulp baits. Great job today guys! LH Hutchins along with his son onboard with Capt. 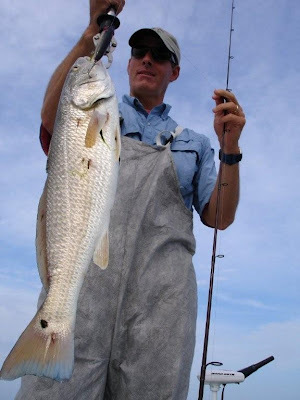 Mike Taylor recently chasing some Redfish in the Boro. These guys had a great time on the reds during this evening trip. Hello everyone, below is a quick note from CFRGNC to please act now, this holiday weekend, to show your support for H918. Recreational anglers need to email Mr. Hackney asap. Contrary to what you might have heard, H918 is still alive. This Weekend, we would urge you to make one last email and phone call to Speaker Joe Hackney, requesting that he move the bill to another committee for a fair hearing. We believe if we can get h918 to the floor of the House that we can win 2 to 1 on the votes! When you send your email to Speaker Hackney, please also copy it to Rep. Carolyn Justice and Rep. Paul Luebke. They need to know that you still insist that this bill have a fair debate, and Rep. Spear has proven to the world that he has no intentions of letting that happen in his committee! Mr. Spear knows that he doesn’t have the votes to kill it in his committee or he would have already done it! It’s high time for this bill to be moved to where it can get a fair chance, and we need you to “encourage” Speaker Hackney to do the right thing! Please do this now! Please copy us back also so we can see just how many are responding! 5/5 Afternoon - Reds on the Fly! For those that aren't out there all the time...I watch all of our bays in the area each season... certain bays hold large schools of reds... I and others catch and release these fish and take an occasional fish home. The fish are there day after day, week after week... until large mesh flounder gillnets are dropped into these areas in mass amounts. Then, within a matter of days the schools dwindle in size, we often find quite a few dead fish (with gillnet scars) floating or lying dead on the bottom, and the few fish that are left are tiny... then, quickly the remaining fish leave the area. Of all the reds we caught and released today, not one died... all were turned back lively, no blood, no injury... I'm not sure where the Division of Marine Fisheries gets there 10% mortality rate from but, onboard my boat and most folks I know... I can honestly say that there is not 1in 10 released fish that die but rather 1 or 2 in 100. These are the most hearty, durable fish swimming in our waters. The only problem is that they can't survive, gills closed all day or night in a gillnet. Instead they die and are discarded. 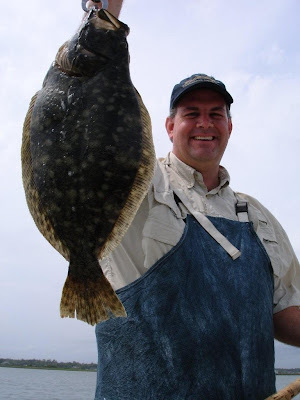 You know, these commercial netters average only about 50 to 100lbs of flounder a day when everything is good.... and yet, I personally know of several commercial flounder giggers that can put that many in the boat without having the bycatch associated with the gill net. Spanish and Bonito are Here! Everything is starting to happen! Folks, the Bonito have been here for a couple weeks now and when the conditions allow, Mike and I are chasing them. This past weekend the Spanish Mackerel showed up in the 2 to 5lb class range too. Wherever you find Bonito, there will be some big Spanish mixed in. In the backwaters we're destroying the blues both trolling as well as casting jigs and topwater baits. We even had a 9lb blue in 2ft of water during our tournament yesterday. We've been finding plenty of 18 to 24in reds inside too with some Black Drum mixed in... and the larger schools of big reds will move in as our tides return back to normal... with some high water... Our sheepshead bite will start within the next two weeks so be sure to call asap for booking your date! late May thru July are the best times for the good numbers of sheepshead. We're already catching Summer Flounder! We just shot a show last week in the Ocean and landed 15 Summer Flounder in several hours of fishing and caught a mess of nice keeper seabass along with them.... check out the show at www.carolinafishingtv.com We're expecting a good Summer Flounder bite this season! As always, we'll be following the schools of Reds all summer... Call today to book your trip for 2009! Now Team Crystal Coast Graphics! 1st Place Sat.! Capt. Mike Taylor and Myself just fished the 1st Redfish Action Series Event this Sat. in Morehead City out of the Anchorage Marina on Atlantic Beach. 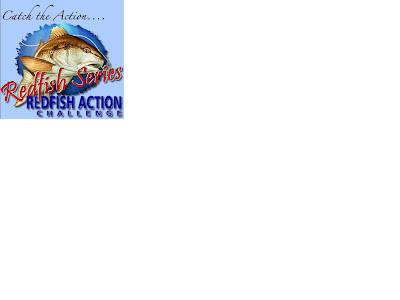 click on the redfish action logo/pic below for the results. Wow! 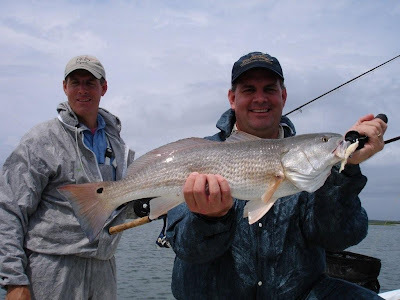 Some of the toughest conditions ever with sustained winds about 30mph and rain moving in late in the day... We were fortunate enough to get on a few reds early in the morning and managed to cull through about 25 redfish and bring a 24in and 24 1/2in fish to the scales for an aggregate weight of 10.52lbs... which, suprisingly... took First Place in the tournament. We were sure we didn't have enough weight to earn first. But, as tough as the conditions were today, it affected everyone's ability to catch the fish they'd been watching... the wind's really had the water chalked up. Mike and I are now tournament fishing under the team name "Crystal Coast Graphics" and would like to thank Chris Ulmer, Owner of Crystal Coast Graphics, for all of his support. He has, without doubt, the highest quality boat and vehicle wraps. Chris takes the time to create the best looking graphics for your ride. Check out his work at www.crystalcoastgraphics.com Also, they are offering special discounts for tournament fishermen!